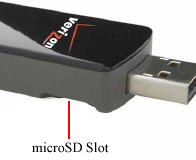 The Verizon Wireless USB760 supports a microSD (TransFlash) memory card. 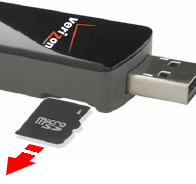 A memory card is not included with the device but can be purchased from any Verizon Wireless retail store or at the online store. Locate the microSD slot (located on the right side of the device). Insert the card as shown. Press in on the card until it clicks into place. To avoid damage to the memory card, do not remove while storing or moving data. Press in on the card then remove as shown.